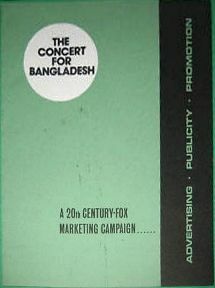 THE CONCERT FOR BANGLADESH is a film directed by Saul Swimmer and released in 1972. 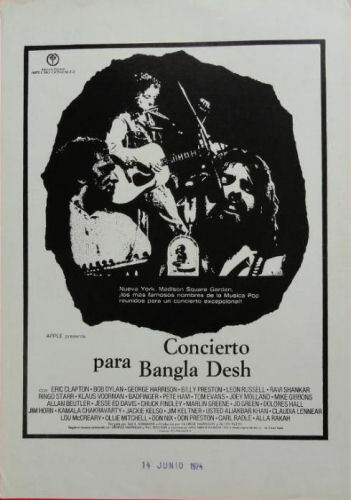 The film documents the two benefit concerts that were organised by George Harrison and Ravi Shankar to raise funds for refugees of the Bangladesh Liberation War, and were held on Sunday, 1 August 1971 at Madison Square Garden in New York City. As well as notable performances from Harrison and Shankar, the film includes "main performer" contributions from Harrison's fellow ex-Beatle Ringo Starr, Billy Preston and Leon Russell, and a surprise walk-on from Bob Dylan. Other contributing musicians include Ali Akbar Khan, Eric Clapton, the band Badfinger, Klaus Voormann, Jesse Ed Davis, Jim Horn and Jim Keltner. The film was the final part of Harrison's "pioneering" aid project for the people of former East Pakistan, following his "Bangla Desh" charity single, the UNICEF benefit concerts, and a triple live album of the event credited to "George Harrison and Friends". 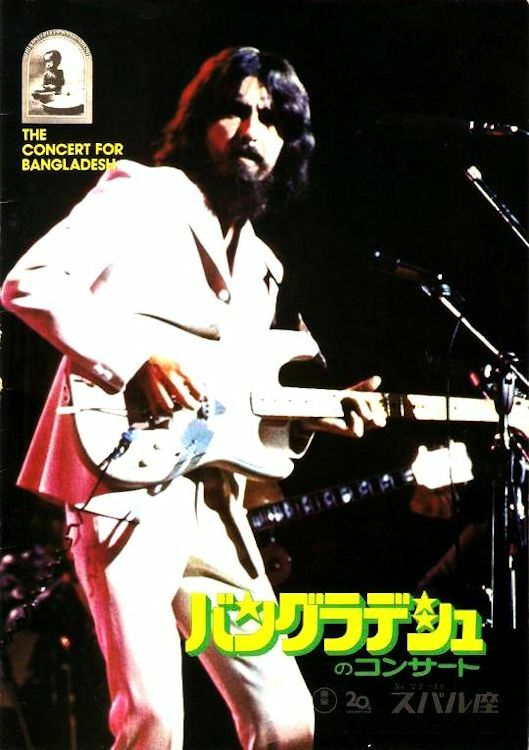 The Concert for Bangladesh was produced by The Beatles' Apple Films; after delays caused by problems with inadequate footage from the event, it opened in US cinemas in the spring of 1972. 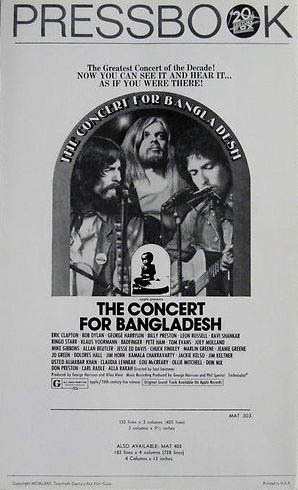 The film was released on DVD in 2005 accompanied by a newly created documentary feature, The Concert for Bangladesh Revisited with George Harrison and Friends, which included recollections from many of the project's participants and contextual input from then UN secretary-general Kofi Annan, US Fund for UNICEF president Charles Lyons and Live Aid founder Bob Geldof. 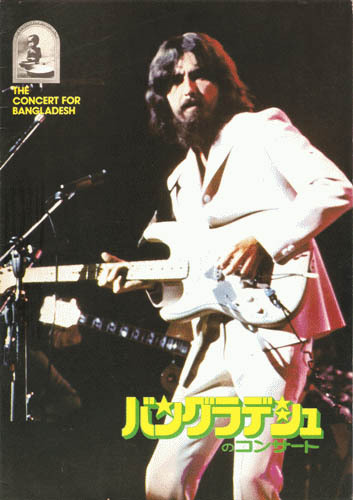 As with the live album, sales of the DVD release of the film continue to benefit the George Harrison Fund for UNICEF. 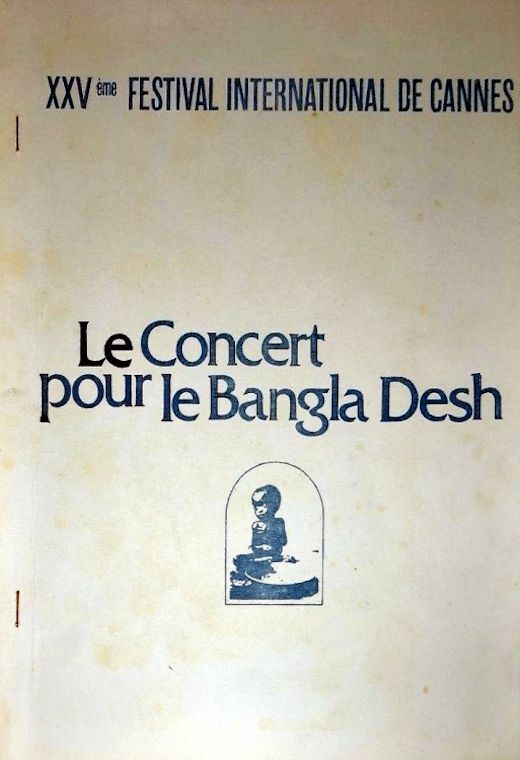 Programme for the 20 & 21 October 1972 'The Concert For Bangladesh' cinema film. 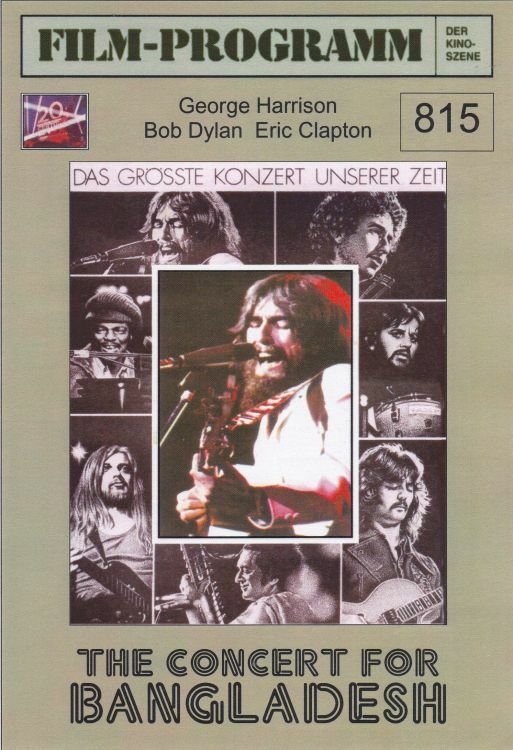 22 Pages, including several stage photos with Bob. Similar to the previous one, with some extra text (Subaru-za, in Japanese) on the front cover. This is the name of the actual cinema where the film was being sold, so it was only available from this cinema � the programmes without any cinema name were available in most cinemas around the country. Similar to the first one, now with a reversed front photo. "Original pressbook for the 1972 film. Pressbooks were provided to movie theatres to help them market and promote the film, so they contain everything a theatre owner would need to know to help market and promote the film, photos, bios, marketing items." French pressbook for the 1972 Festival de Cannes. Germany, film programme. No. 815, 8 pages. Strange item: looks like a private production. Made by Peter Kranzpiller, 88267 Vogt (Germany). The price is noted in Euros, so this was not made in 1972. Thanks to Juergen Wasser for the scan and information.